With the strongest pack ever, it came as no surprise that the men’s race was exceedingly fast from the start – separating the wheat from the chaff early on. One notable victim, from the Swiss perspective, was last year’s winner Romand Furger who couldn’t keep up with this pace. Dario Cologna, too, was caught unawares by the high tempo and fell behind early on. But, he managed to fight himself back to the front and, from then on, played a key role in the frontrunner group that relentlessly forced the pace. The decisive phase began in the Staz Forest after St. Moritz. Besides Cologna, the young Cédric Steiner from Davos joined the group of nine in the lead; the group was in tune and kept up the pace. A moment of anxiety came up just before La Punt when Dario Cologna took a fall. To everyone’s relief, he managed to rejoin the lead in no time. 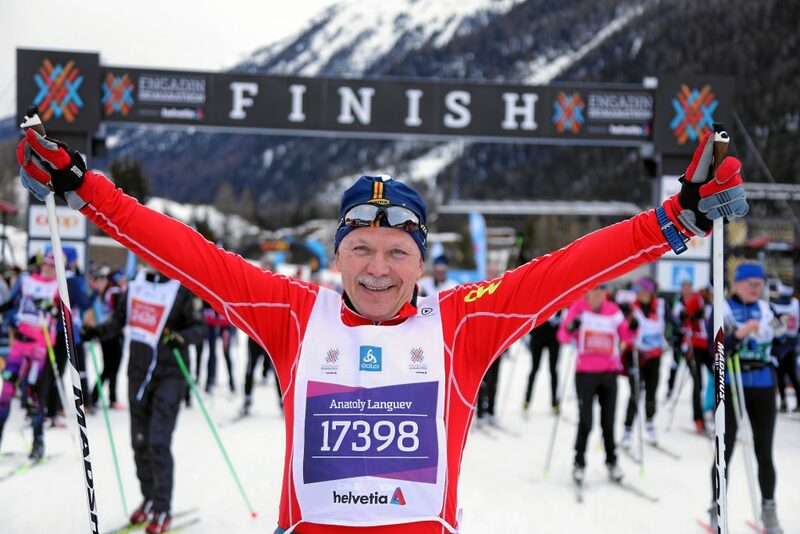 Dario Cologna, 4 times Engadin Skimarathon winner. Anders Gloeersen from Norway was taking a less active role. 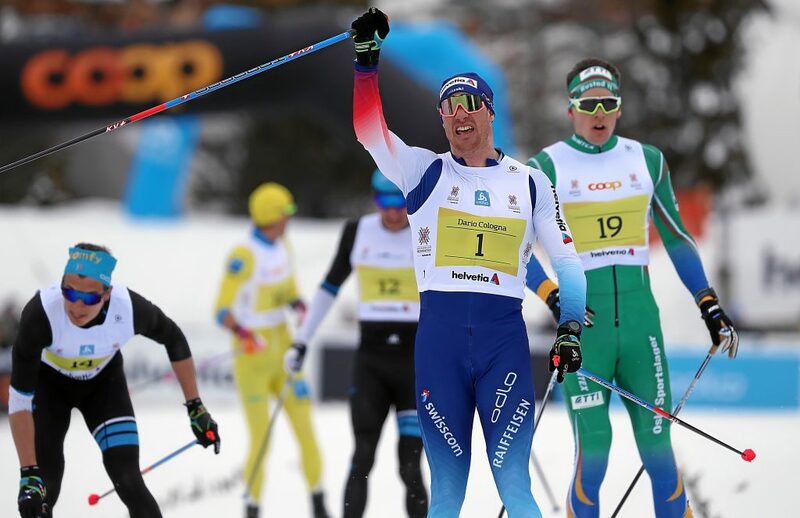 The winner in 2014 and runner-up in 2018 turned into the home stretch together with Cologna, Jean-Marc Gaillard and Clément Parisse. Cologna put on a relentless spurt to grab his fourth win with a record time. Gaillard, Gloeersen, Parisse, and Steiner crossed the finishing line within a second. For the first time, the female athletes had a five-minute head-start so as not to be run over by the male pack. The change proved its worth: the female race was more attractive to watch than in previous years and easier to follow. Nathalie von Siebenthal lived up to her role as a favourite. 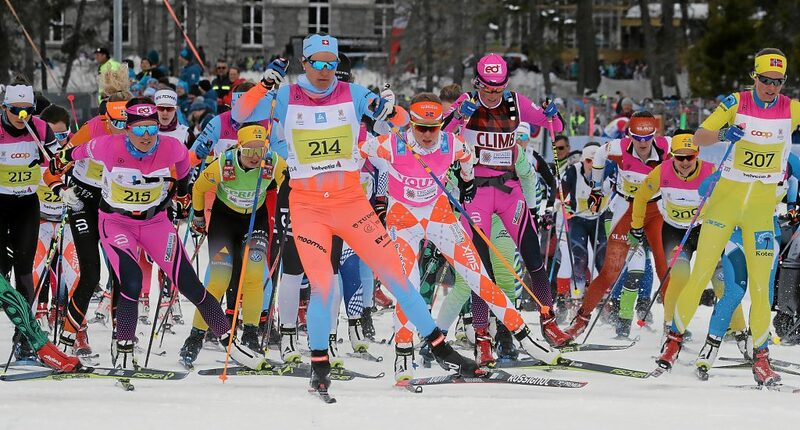 She was very dedicated throughout the race and made it clear from the start that she was set on winning at her first crack at the Engadin Skimarathon. When the men caught up with her just before St. Moritz, she kept pace with them adeptly and managed to gain a lead of just short of thirty seconds by the time she reached Pontresina. On the long flat stretch around Samedan airport, she raced by herself in between two groups of men and lost most of her lead. “That was the hardest part of the race,” she commented afterwards. She found a saviour in Curdin Perl. 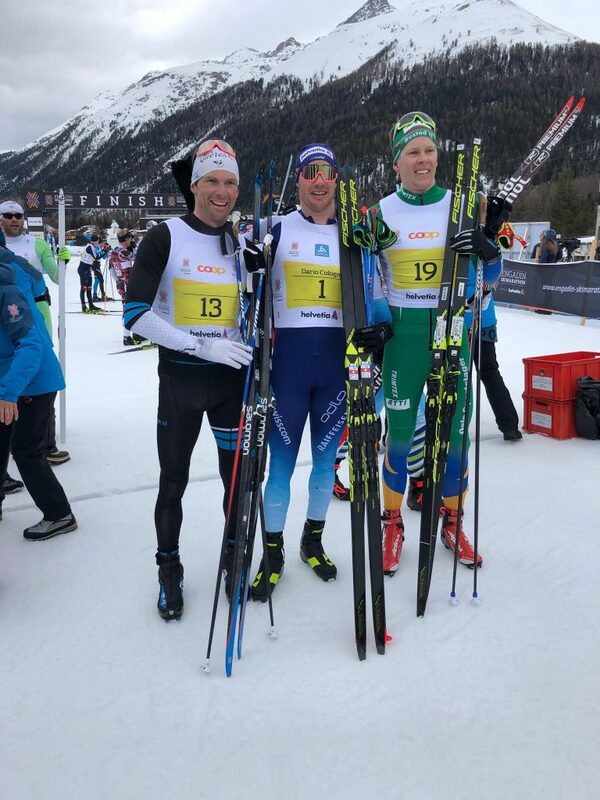 The native from the Engadin and Christian Stebler from Nidwalden raced along with their compatriot to the finish. In their slipstream, Nathalie von Siebenthal was able to nudge up to her lead to 59 seconds. The organisers announced a significant change for the next event. 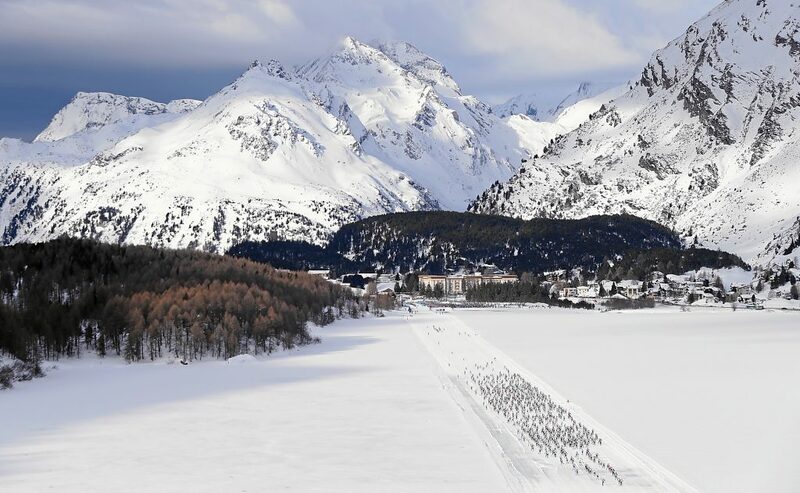 The town of Pontresina is increasing its commitment to the Engadin Skimarathon and is planning to improve the infrastructure at the finish of the Half-Marathon and the Engadin Night Race. “We are looking into building a kind of stadium,” the town’s mayor, Martin Aebli, told the media. “The Engadin towns have been the most important partners of the Engadin Skimarathon since the start 51 years ago. So, it is great to hear that Pontresina is willing to commit even further,” says Managing Director Menduri Kaspar, pleased with the news. In line with the new strategic partnership, the Marathon Village, along with the race registration desk, will move to Pontresina in 2020. “We are envisioning a public festival in the heart of our village,” comments the mayor. 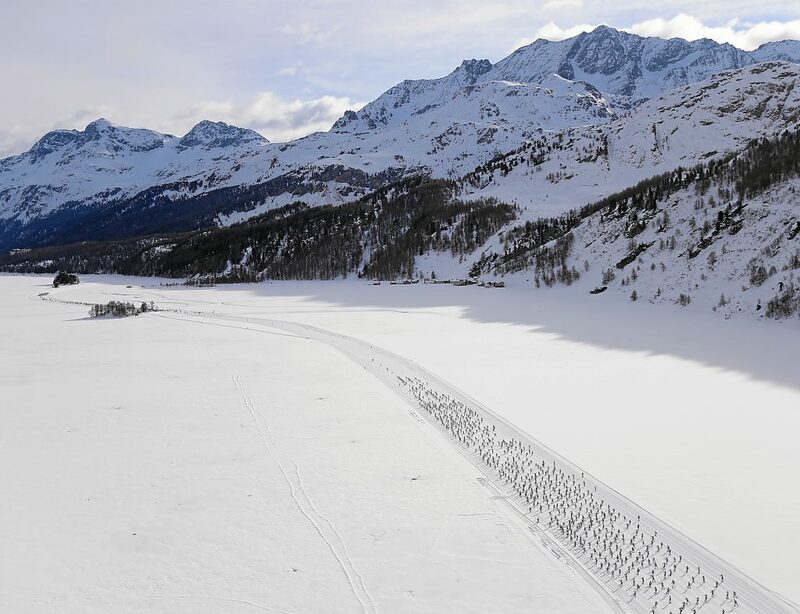 14,200 entrants took part in the 51st Engadin Skimarathon. For the second time in a row, as in the jubilee edition 2018, the race was sold out early. Registration for the 2020 race are already open again.